Pharmaceuticals owe their effects mostly to their chemical composition, but the packaging of these drugs into specific physical formulations also need to be done to exact specifications. For example, many drugs are encapsulated in solid microparticles, the size and shape of which determine the timing of the drug's release and its delivery to specific parts of the body. When engineering these drug microparticles, consistency is key, but common drug manufacturing techniques, such as spray drying and ball milling, produce uneven results. The ideal method involves microfluidics, a kind of liquid assembly line that drips out perfectly sized microparticles, one at a time. University of Pennsylvania engineers have now developed a microfluidic system where more than ten thousand of these devices run in parallel, all on a silicon-and-glass chip that can fit into a shirt pocket. Scaling up microfluidic systems has been a major challenge, as they depend on a tightly controlled flow rates to produce particles of a consistent size. The Penn team's innovation is new fluidic architecture, built with the technology used to manufacture computer chips, resulting in a system that can manufacture these drug particles a thousand times faster than ever before. The team, led by David Issadore, assistant professor in the School of Engineering and Applied Science's Department of Bioengineering, and Sagar Yadavali, a postdoctoral researcher in his lab, outlined the design of their system in the journal Nature Communications. Daeyeon Lee, professor in the Department of Chemical and Biomolecular Engineering, and Heon-Ho Jeong, then graduate student in his lab, contributed to the study. The Penn team is currently testing their system with David Lai, a research investigator at GlaxoSmithKline. Current pharmaceutical microparticle manufacturing techniques involve spraying them in liquid form from a nozzle and letting them dry, or milling larger solid particles down in a tumbler. However, since the microparticles are being made en masse, there can be significant variations in their size and shape. "These manufacturing problems mean that an enormous amount of time and money is spent on size reductions," Yadavali said. "That leads to higher costs." Microfluidics provides a potential solution to these problems. By synthesizing the drugs in a network of microscopic channels and chambers, surface tension and drag forces can be finely tuned to generate particles of a consistent size and shape. However, there are intrinsic limitations to how fast these microscale devices can work. "The bottleneck for increasing the throughput of microfluidics is a fundamental physics problem," Issadore said. "We cannot run the individual microfluidic devices faster than any other lab, because the microfluidic phenomenon that enables the drug microparticles to be precisely fabricated stops working above a critical flow rate?—?they go from making bubbles to making unstable jets." Typical flow rates are a milliliter-per-hour, far too slow to be of use in an industrial setting. Since increasing the flow rate is not an option, the only way to scale up production is to increase the number of devices. Previous attempts at large-scale parallelization struggled with another trade-off. In order to distribute flow evenly to all of the devices on the chip, each individual device must have a large pressure drop across it relative to the pressure drop along the delivery channels that feed it. This results in each device running slower than they would if they were fed individually. The Penn researchers solved this problem by separating the devices into two, one component that provides the required pressure drop and another downstream that makes the particles. This allows many devices to be incorporated in parallel without having an effect on the throughput of each one. "By incorporating high-aspect-ratio flow resistors upstream of each device," Yadavali said, "we can decouple individual droplet design from the system-level design. which allows us to incorporate any type of microfluidic particle generator we want, and as many as we can fit onto a chip." Using lithography to simultaneously etch 10,260 devices into a four-inch silicon wafer, sandwiching it between two glass plates to make hollow channels, and hooking up its single sets of inlets and outlets, the Penn team's system produces an effective flow rate than is more than ten thousand times faster than what can be typically achieved in a microfluidic device. The Penn team first tested their system by making simple oil-in-water droplets, at a rate of more than 1 trillion droplets per hour. To demonstrate it with materials more relevant to drug manufacturing, they also made biocompatible microparticles out of polycaprolactone, at a rate of about 328 billion particles per hour. "Drugs can be mixed into polycaprolactone microparticles, so that controlled amounts of drug can be gradually released as the particle dissolves," Sagar said. "The rate that the drug leaves the particle is dependent on the particle size, which is why having a consistent size is so important." The researchers only mixed the polycaprolactone with water; testing on a real drug would have been prohibitively expensive given their system's rate of production. "We at GSK are delighted to be part of a research collaboration with Daeyeon and David's research groups. Congratulations on an exquisite and impactful publication," said Lai. The researcher's microfluidic system is currently capable of this kind of simple drug packaging, but other, more complicated manufacturing techniques are possible. 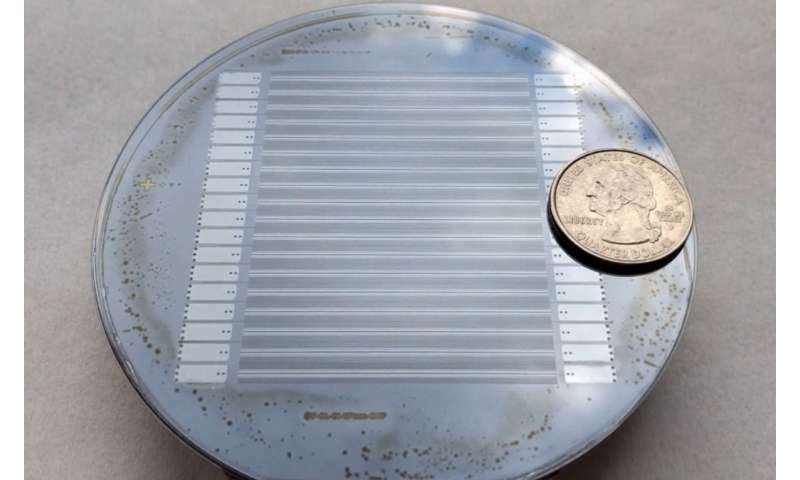 "We are now working to implement additional microfluidic operations onto our chip, including miniaturized versions of solvent extraction, crystallization, and other traditional chemical engineering processes," Issadore said. "By bringing more of the operations necessary to formulate the drug onto our chip, precise 'designer' microparticle drug formulations can be produced at an industrial scale."